When DC Comics relaunched their entire line-up under the "New 52" banner one of the titles that got a fresh new take was 'Wonder Woman.' Under Brian Azzarello and Cliff Chiang, the Amazon Princess got a more familial drama involving her Greek mythology roots. 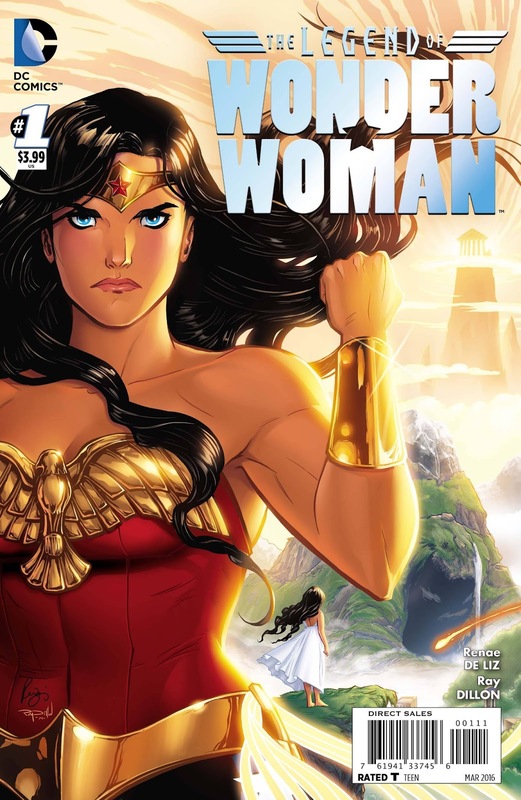 It was a brilliant and exciting run that reinvented Wonder Woman's mythos. It also stirred some controversy when Diana's origin was altered from being born of clay and blessed by the gods to being the biological daughter of Zeus. 'The Legend of Wonder Woman' returns her to her more magical beginnings with a lyrical and lush retelling with an amazing premiere issue. The story of Wonder Woman rightfully begins with Hippolyta. Renae De Liz eloquently tells the arc of Hippolyta's rise then fall and rise again of the mortal who became immortal. Despite her many triumphs and challenges along the way she still felt a void. That void was filled "from the clays of Themyscira and the hope of Hippolyta's mind, her gift was sculpted." And thus, Diana was born. De Liz shows a reverence and respect for the 75 years of Wonder Woman canon with the lineage of the amazons and the resiliency of Hippolyta. It carries over to Diana who, still a child, studies to be a learned princess while yearning to train to fight. She's wise beyond her years and attuned empathetically with the island. We get to see a version of Diana we've hardly gotten before, the coming-of-age ingenue. De Liz gives her a grace and strength that long time fans will recognize and new ones will admire. This isn't just a retooling or homage to the iconic Wonder Woman it's a love letter by two very talented creators. De Liz as writer and penciler has created a beautiful tapestry of prose and pictures. Each scene is laid out strategically giving each panel room to breathe or allowed to melt into the other. It's dreamlike, fluid and no space on the page is wasted. Dillon provides the inks and colors filling the detailed images with vibrant and lush hues. They build the world of Themyscira with distinctive Greek architecture, green mountains, scenic beaches and fantastical beasts. Painstaking time was spent making sure the reader would get entranced by the visuals - Mount Olympus, Pegasus, monsters - and it all works. Something dark is lurking on the island and only Diana and the warrior Alcippe senses it. She wants to learn to fight trying to balance her mother's philosophy of peace and learning with her own call to defend others. That dichotomy will follow her into adulthood. 'The Legend of Wonder Woman' is the origin story for a new generation. It holds on to the classic beginning while exploring her growth as a young princess discovering her power. De Liz and Dillon have poured their hearts on the page giving this limited series an extraordinary start that is intoxicating and fantastic.